Latest PSU Jobs Notifications 2018 are here. Know the complete details of PSU through GATE 2018. Apply Online for Public Sector Undertaking Recruitment 2018. Find Board wise PSU Vacancy Details. Refer Public Sector Undertaking Online Registration Dates, Process of Selection, PSU Eligibility like Age Limit, Educational Qualification, etc. from the following sections. Hello, Aspirants!! As per the present criteria, most of the job seekers are desiring to get an employment offer in Public Sector Units in India. Before applying for Jobs in PSU, candidates must know the Importance of PSU in India. PSUs really offer a good job profile to the aspirants who possess the required Eligibility Criteria. The importance of Public Sector Enterprises is that they create an impact on the society through technology and serve the country. PSU has also laid the foundation for the growth and prosperity of other sectors. Public Sector Undertakings in India has given the framework for Other sectors in manifesting growth and abundance in the country. Are you in search of a highly paid job in Public Sector Units? If your answer is yes, then you need to be aware of the answer to a question “What is PSU“? PSU is generally known as Public Sector Undertaking. Actually, these companies are controlled by Union Government of India or one of the many State Governments or Territorial Government. PSU Sector is the most prominent sector among all the sectors which has contributed a lot towards the Indian Nation. It has given its contribution in terms of the growth and development of GDP but also assured self-reliance to the residents of India. In these Days, Public Sector Units are becoming more prestigious. So, most of the Candidates moving towards Govt PSU Jobs. Every Year public sector undertakings in India release many PSU Recruitment Notifications. Likewise this year also, the Union Authorities will dispatch advertisements for Government PSU Openings. We provide the complete details of Jobs in PSU through Gate here. So, the Interested PSU Job aspirants can check the details and Apply Online for Latest PSU Jobs according to the eligibility. Job in PSU helps the aspirants who have Engineering and Diploma as their qualification in their career growth. Individuals who are seeking a career in reputed PSUs should apply for GATE (Graduate Aptitude Test in Engineering) as it is a primary test to be taken by them to get into PSUs. Officials will consider the candidates whose GATE Score is high, to filter eligible aspirants for PSU through GATE. The main objective of the Public Sector Undertakings/ Units is to analyze candidates’ performance in GATE through GATE Score. Graduate Aptitude Test in Engineering not only analyses your technical skills but also logical and analytical skills. Aspirants of PSU Recruitment through GATE 2018 should possess very strong fundamentals. The Public Sector Enterprises Offer best PSU salary, many benefits. Here you get the complete list of PSU Jobs in India. Apply upcoming PSU exams, Current vacancy in PSU through the links on this page. The PSUs in India are classified into three groups based on various factors like Global Presence, Annual Revenue, and Operations. They are Maharatnas, Mini-Ratna PSUs, and Navratnas. Candidates who get a good score in GATE Exam will surely get a job in Navratnas and Miniratnas. 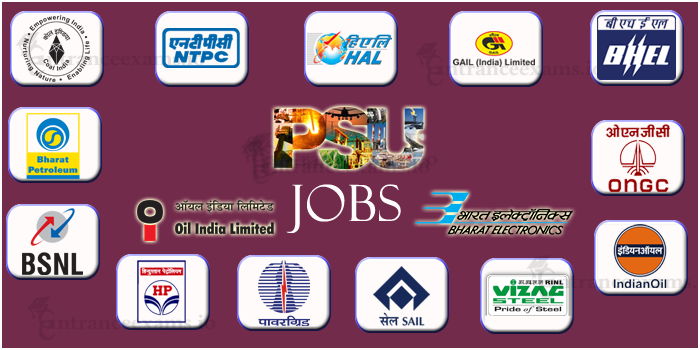 The following are the List of Jobs in PSUs through GATE. Container Corporation of India Limited. Metallurgical and Engineering Consultants Ltd etc. Except for Engineers and Diploma holders, Public Sector Units regularly announce PSU Vacancies for individuals through PSU Recruitment without GATE 2018. On this page, we provide the complete information about PSU Exams, PSU Notifications, Govt PSU Jobs. Therefore, Candidates who are dreaming of leading their career in reputed Indian PSUs must visit our site entranceexams.io on a regular basis.